In May 1998, eight Carmelite Nuns from the Philippines arrived in Tamale to establish their first convent in Ghana but have failed to find local women to help fill their ranks. It is early morning and the birds are chirping at the Carmelite convent in Tamale. It is a serene, peaceful place and for the last 18 years a group of Catholic nuns from the Philippines have been calling this place home. As they gather in prayer and contemplation, it is apparent that there is not one Ghanaian woman present. However, Sister Mary Bernard, the senior Carmelite sister, says they are ready to welcome Ghanaian women into the fold. "We're here for them. We're here for Ghanaian ladies who feel that the best way to serve God is to just enclose themselves and spend their time in prayer," said the sister. 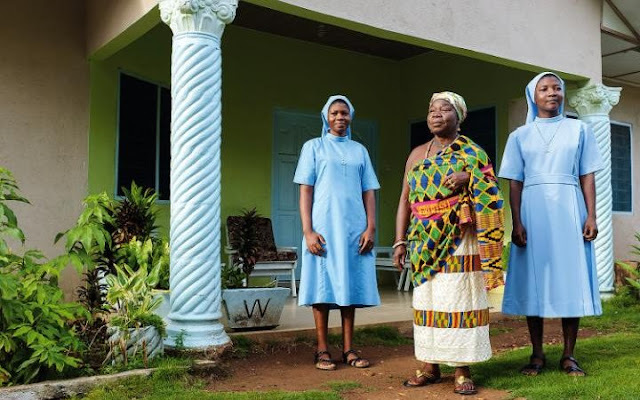 When the Carmelite nuns first arrived, the aim was to provide a place and an opportunity for young Ghanaian women who felt that a life of sacrifice, prayer and contemplation was the best way in which to serve God and the Catholic Church. The Catholic nuns are now growing old. They said they will soon die and need replacements. That offer is unlikely to arouse much interest. But in the intervening 18 years, only one Ghanaian woman attempted to join the convent, but she ended up running away. She explained why she decided to quietly abandon her quest. "I went to fall in love with God. As I descended further, I found myself not fit so I had to discontinue," said the young woman who asked DW not to reveal her name. There has been criticism from the monks in a nearby monastery that young Ghanaian women lack interest in a life of religious observance. Sister Maureen Theres, another of the Philippino nun at the convent, said they have done all they can. She wondered whether their time wouldn't be better spent back in the Philippines. "We have sacrificed everything to leave our country, our family, our monastery to be here. How can we stay here?" she asked. "We will become very old and die so it is better to be in the Philippines. We can be more useful there." A woman is qualified to join the convent when she is younger than 40 years old and in good health. Father Gerald Zenah, Chaplain of the Catholic Youth in Tamale, wants the church to amend the conditions for entry and raise the age limit. "I think that we should rather target the senior ones, like people who have made it in life. These are the people that we should target, when they go in there, there is that maturity and they can withstand these demands," he said. The Carmelites have said they will be forced to close the convent if Ghanaians don't join them. "We have been told by our superiors that after five years if we don't get any new members, we might be forced to fold and return to our country. It is worrying". Ghanaian women in Tamale DW spoke to found the prospect of life in a convent rather unappealing. "Leaving my family, my friends behind to go and live such a contemplative life? I don't think I could do it," said a local woman. "I would not be allowed to even watch television. God!" It is not clear what the premises housing the convent would be used for should the nuns return to the Philippines. But memories of their peaceful lifestyle may well persist in the minds of local Ghanaians long after they have gone.